After the natural disaster of Hurricane Katrina, and the manmade horror of the explosion at the vampire summit, Sookie Stackhouse is safe but dazed, yearning for things to get back to normal. But her boyfriend Quinn is among the missing. And things are changing, whether the weres and vamps in her corner of Louisiana like it or not. In the ensuing battles, Sookie faces danger, death…and once more, betrayal by someone she loves. And when the fur has finished flying and the cold blood ceases flowing, her world will be forever altered. The TV series based on Charlaine Harris’ bestselling Sookie Stackhouse novels are now showing on the Showcase channel. COMMENTS FROM BOOKTOPIA: This series had me laughing out loud. Sookie is a charming character to follow, full of foibles and witticisms about the constant vampire strife she finds herself in. She also has the handy knack of reading minds, especially useful when meeting the range of weird and wonderful creatures that seem to waltz through her life. Sookie's life as a waitress in small-town Louisiana coexists with vampires, since the invention of synthetic blood in Japan, and one in particular whom Sookie finds hard to resist. Sookie's naughty thoughts, interspersed with musings on her predicaments, make this a hilarious little roller-coaster of a series. In addition to Sookie, Charlaine has another heroine with a strange ability. Harper Connelly, lightning-struck and strange, can find corpses . . . and that’s how she makes her living. 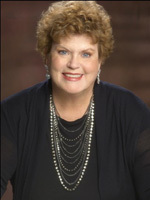 In addition to her work as a writer, Charlaine is the past senior warden of St. James Episcopal Church, a board member of Mystery Writers of America, a past board member of Sisters in Crime, a member of the American Crime Writers League, and past president of the Arkansas Mystery Writers Alliance. She spends her “spare” time reading, watching her daughter play sports, travelling, and going to the movies.